This charming and bittersweet coming-of-age story featuring two girls of color falling in love is part To All the Boys I've Loved Before and part Simon vs. the Homo Sapiens Agenda. Sixteen-year-old Sana Kiyohara has too many secrets. Some are small, like how it bothers her when her friends don’t invite her to parties. Some are big, like the fact that her father may be having an affair. And then there’s the one that she can barely even admit to herself—the one about how she might have a crush on her best friend. When Sana and her family move to California, she begins to wonder if it’s finally time for some honesty, especially after she meets Jamie Ramirez. Jamie is beautiful and smart and unlike anyone Sana’s ever known. There are just a few problems: Sana's new friends don't trust Jamie's crowd; Jamie's friends clearly don't want her around anyway; and a sweet guy named Caleb seems to have more-than-friendly feelings for her. Meanwhile, her dad’s affair is becoming too obvious to ignore. Sana always figured that the hardest thing would be to tell people that she wants to date a girl, but as she quickly learns, telling the truth is easy…what comes after it, though, is a whole lot more complicated. Misa Sugiura’s ancestors include a poet, a priestess, a samurai, and a stowaway. 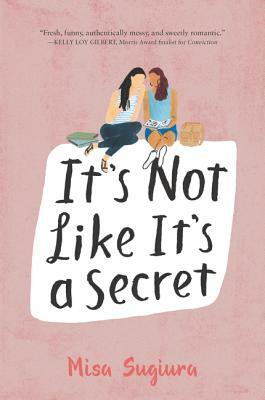 Her first novel, It’s Not Like It’s a Secret, was the winner of the Asian/Pacific American Award for YA Literature. Her second novel, This Time Will be Different, is the HarperCollins Children's Books Lead Read for Summer 2019. Misa lives under a giant oak tree in Silicon Valley with her husband, two sons, two cats, and a graybanded king snake. Visit her online at www.misasugiura.com.